Follow the step-by-step guide on how to grow okra from seeds and how to take care of okra plants. Okra or Okro (Botanical name: Abelmoschus esculentus Moench), is an annual summer growing vegetable of hibiscus mallow family (Malvaceae). Growing okra from seeds in containers is quite simple provided you take its care like flowers, pollination, fertilization, pests and diseases and harvesting. Okra is believed to have originated in West Africa, Ethiopia and South Asian. The okra plant is grown in tropical, subtropical and warm temperate regions through out the world. I am growing okra from seeds in Sydney and can be grown in other parts of Australia in summers. India, Bangladesh, Afghanistan, Pakistan, Burma, Japan, Malayasia, Turkey, Iran, Western Africa, Brazil, Ghana, Ethiopian, Cyrpus, Yugoslavia and the Southern United States are the commerial growers of okra, India being the top producer. 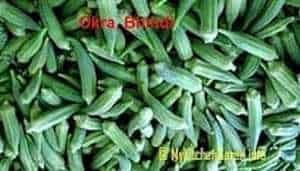 Okra is also known as lady fingers, bhindi, bhendi, dherosh, ochro, bamia, ki ngombo, gumbo, etc. Okra is rich in vitamin A and low in calories and is used as a vegetable and a natural thickener for soups, stew and gumbo. Okra is a hairy, annual plant whose blooms are one of the most beautiful blooms in the vegetable garden. The okra plant produces edible green seed pods all summer long; when you harvest a pod, another grows in its place! Okra is mainly propagated by seeds. It needs similar growing conditions as for tomatoes (growing tomatoes in pots). Melons, cucumbers, sweet peppers, eggplant, etc. are the best plants that can be grown along with okra. Sunflowers can be planted near okra plant to attract bees for okra pollination. Okra acts as a trap crop for stink bugs, which damage tomatoes, beans, peppers and other garden vegetables. Okra can repel stink bugs away from your garden. Do not plant okra where you have grown potatoes, tomatoes, cabbage, broccoli, or similar vegetables. Bhindi plants can be grown in garden bed or in a pot, even in a bucket or in any big container. If you have only small place to grow okra, you can grow it in pots on your terrace or balcony. As the roots get deep to about 12 inch so if you plant in a pot, select a 12-14 inch deep pot with drainage holes at bottom. Okra can be grown in hot humid areas with a preferable temperature between 25-35°C. It requires a long, warm and humid growing period. Frost and extremely low temperatures are the enemies of this plant. Okra grows best in full sun. It needs at least 6 hours of full sun every day. Okra needs nutrient rich fertile well-draining soil with a pH level 6.5 - 7.0. Dig the soil about 12 inch deep and break big chunks of soil. If the soil is clay, mix some river sand. Mix compost (making compost at home) or cow manure or slow release fertilizer in the soil. Okra seedlings are difficult to transplant so it is better to sow the seeds directly in the garden. If you live in a warm area, you can sow seeds directly in the garden when the soil temperature is 25-35°C. Sow the seeds about 1 inch deep and 12 to 18 inches apart in rows separated by 3 feet. If you live in a cooler place, sow okra seeds in a small bio-degradable small pot indoors 3 to 4 weeks before the last spring frost date. Put the pot in a warm sunny room during the germination period. When the weather warms up, transplant the seedlings outdoors with the container when they grow to 2-3 leaves, 12 to 18 inches apart in rows separated by 3 feet. The bio-degradable pot will merge in the soil. Keep the soil moist after sowing the seeds. The seeds will germinate in 2 to 10 days depending on the temperature. Soaking the seeds overnight prior to sowing will speed up germination. Keep the plants well watered. Plants in pots will need plenty of water daily. over-watering can cause the plants to start rotting. Do not wet the foliage. It's best to water okra in the morning. Apply a thick layer of mulch to keep the soil damp and to reduce the weeds. Since okra needs plenty of nutrients to grow, add nutrients to the soil periodically. Absense of nutrients may result in okra plants that produce a less number of fruits. Rack some compost or bagged fertilizer or slow release fertilizer around the plants three times; first after planting the seedlings, then after the first pods begin to grow, and a third time aboutg a month. You can feed with a liquid fertilizer periodically. Okra has perfect flowers (male and female reproductive parts in the same flower) and is self-pollinating. The flowers are large around 2 inch in diameter, with five white to yellow petals with a red or purple spot at the base of each petal. Flowers open only once in the morning and close after pollination on the same day. Although insects are unnecessary for pollination and fertilization, the okra flowers are very attractive to bees and the plants are cross-pollinated by insects, such as bumblebees, when many varieties are grown in the same area and blossom at the same time. How long does it take to harvest okra? It takes about two months to harvest first okras after sowing the seeds. You may wonder, how often should okra be harvested. The okra pods will start to grow after about 8 weeks after planting. Okra pods can mature in just four days after flowering. Harvest the pods when they are 2 to 3 inches long. The longer the pod stays on the plant, the more tough it becomes, not suitable for eating. So okra requires frequent harvesting. Using a scissors, cut the okra pods where their stems meet the branches of the plant. You will notice that another okra pod will emerge soon from the same spot where you made the cut. You may wear gloves when you harvest the okra because the leaves and pods can irritate the skin. Harvesting daily or on alternate day during the peak season will encourage more fruits. Remove the lower leaves to increase production after the first harvest. Remove tough pods from the plant otherwise it will stop producing fruits. If the plants grow 6 - 8 high, you may prune one third of the top in late summer to get a late crop. How can you tell when Okra is ready to Harvest? Test the pods by touching, if they feel very soft, it means, they are good for harvesting. Look at the color of the pods. If it is whitish, then they are somewhat woody. If the pods open easily by pressing it at the middle, then it is too tough to eat. The okra plants are prone to damage by various insects, fungi, nematodes and viruses. The major insects are fruit and shoot borer, aphids, Japanese beetles, stink bugs, jassids, whiteflies, ants, corn earworms and flea beetles. The okra plants may also get many diseases affecting leaves, flowers and fruits. Keep an eye out for pests. If you see the signs (holes in the leaves) of pest infestation, remove the bugs by hand or spray the leaves with neem oil spray or simple soap water to keep the pests away. Fresh okra can be kept at room temperature/fridge for 5-8 days. You can freeze extra okra to use them during the winter. Put the uncooked pods into a freezer bag and keep them in the freezer. Some suggests to blanch them before freezing by putting them into boiling water for 3 minutes, then remove and plunge into iced water or under cold running water to halt the cooking process. Then chop them into small pieces and place on a tray and freeze them until firm. Transfer the firm okra pieces to a freezer bag for long-term storage. Okra's seeds can be saved for next year planting. For this, at the end of the season allow some pods to remain on the plant to mature, dry out and turn brown, begin to split but not split open. At this stage, harvest these pods. Break the pods when you want to sow the seeds or take out the seeds and store in a air-tight bottle. No need to wash the seeds. The dried pods or seeds may be stored for up to five years. Seed can be saved from open-pollinated varieties. To avoid cross-pollination, the flowers can be isolated by placing a paper bag over them for 24 hours when they are open. If okra flowers are bagged, 100% of the flowers will set seed.